So I blocked off a whole Saturday afternoon to sit down and experience the full Che Roadshow Edition of Stephen Soderbergh’s huge epic two-part dramatic take on Che Guevara. The Roadshow version, at $18 (volume discount applied), contains no commercials, trailers, or even opening credits. An overture begins the film, like epics of past, over top of a map a Cuba, identifying the regions and cities important to the film. My colleague Blair Stewart has already written a fine review of Che: Part I (click HERE), which I defer to. Part II continues where Part I left off. Instead of a map of Cuba, during the opening overture Soderbergh shows us a map of South America, pinpointing all the countries in the continent and focusing in on Bolivia – Che’s next stop in liberating Latin America. Via newspaper reports and a speech from Castro himself we are told that Che has resigned his political post and disappeared. We then watch as a disguised Che secretly flies out of Cuba and into Bolivia. After his exploits in New York Che has become a recognizable name and face. 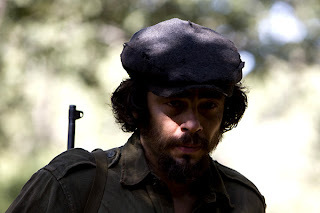 The first act is a political story a fine contrast to the war film Soderbergh shot in Part I. Che is in espionage mode as he quietly moves across the border. Once in Bolivia he immediately seeks to link up with the leader of the Communist party, Mario Monje, played by a humble Lou Diamond Phillips. Unfortunately instead of welcoming the guerrilla with open arms he rejects his offer to lead a new revolt. Though he never expresses it, perhaps this was an unforeseen blow to his ego. Despite the rejection he assembles a group of young and inexperienced soldiers whom he trains in the art of guerrilla warfare. There’s visible difference between the soldiers we saw in the Cuba and the soldier in Bolivia. Che’s downfall is not heading to his own words. In part I, when asked about whether he could defeat an army better equipped and with more manpower, his response refers to an incalculable x-factor representing the passion of one’s people determining the ability to win a war. Che fails to see that his troops do not have this passion. Monje knew this and tried to tell Che, and so Che ultimately stretches himself too far. A victim of his own ego perhaps. None of this is told to us by Soderbergh. While we are greatful for Soderbergh’s respect for his audience not to overtly dramatize these internal thoughts, we never get deeper than these relatively shallow inferences. The downfall of Che, the man, is matched by the slow downfall of Che, the film. The second and third acts of Part II is a repetition of narrative structure of Part I. We see similar guerrilla movements throughout the jungles and mountains of Bolivia, except the forces he so strongly pushed back are slowly encroaching on him. As my colleague noted in Part I, Benicio Del Toro's performance is unheroic, free of histrionics. Soderbergh attempts to draw his character from the machinations of his guerrilla actions and while the concerted approach is fresh, at 4.5 hours, it ultimately feels like a shallow rendering of the man. A grand technical exercise, a great war film, but a disappointing character study. Despite most of the negative criticism of this film, it's still a remarkable achievement, the type of risk-taking we want Soderbergh to try.